If someone says ‘Atlantic coast golf destination’ what often comes to mind is the “Grand Strand” or simply “Myrtle Beach,” shorthand for the 50 miles or so running north from Pawley’s Island, South Carolina. 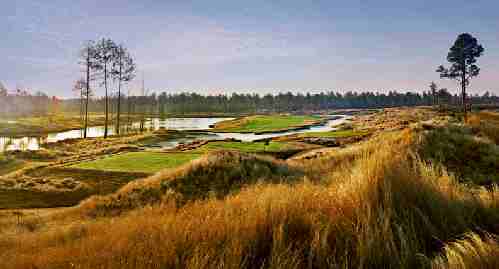 Golfers know about Myrtle Beach’s 100 or so courses however on a recent trip we concentrated on the extreme northern end of the Grand Strand, even a little beyond its limits. In fact the play (with a small exception described later) was in the Brunswick Island area of North Carolina not South Carolina. 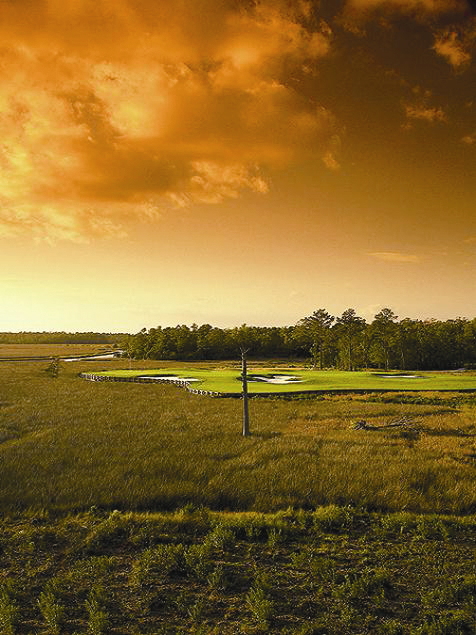 The Brunswick Islands and nearby mainland bill themselves as North Carolina’s Golf Coast for a good reason. There are 33 golf courses with many strung like pearls down Route 17 and two – Bald Head Island Club and Oak Island Golf Club – out on the barrier islands. 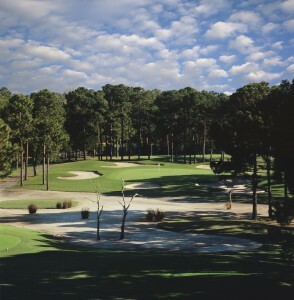 The Golf Coast is an ideal destination if you are looking for lazy days on the beach plus some golfing fun; easy to reach either by car or by air with many flights into the Wilmington, North Carolina airport. Quiet, low stress and picturesque are apt words to describe the whole area and while you’re there you even get to dine on fresh local seafood – try the crab cakes or Carolina flounder, they are real treats. Cate chose his routing through marshes and oaks with wide corridors so one gets the feeling of being a little isolated walking down the fairway since adjacent holes are only glimpsed briefly. 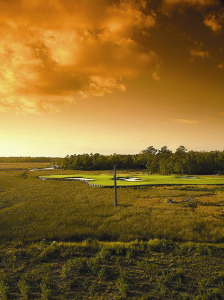 The marsh is an ever present and a factor on almost every hole but by choosing the proper set of tees to match your ability a round at Cape Fear becomes both fun and challenging. southernmost barrier island in North Carolina with suite accommodations near the convention centre plus 400 private owned villas. The beach is close by but the main attraction is the three golf courses; one each by Dan Maples, Willard Byrd and Rees Jones. We particularly enjoyed playing the Bryd course. Even from the back tees the length at 6,750-yards is manageable for most men and the ladies will find a strategically exciting round from the forward markers as well. Two memories stand out from playing the Byrd course. First, in many cases the driver may not be your friend as tee shot placement is often the key to making a par or even a birdie. Secondly, the sloped and modestly mounded greens place a premium on hitting approaches to the proper place on the surface so as to have the most realistic opportunity to have only one putt. Right up the road in Calabash is the Farmstead Golf Links which was also designed by Willard Byrd and opened in 2001. Byrd had somewhat different topography here compared to his Sea Trail course, creating more of a links-style layout. Fairways snake their way between the stands of indigenous grass, other plants and of course being near the coast there’s lots of water. As is often the case though, when playing from the correct tee set (the black markers are a strenuous 7,242-yards!) the water carries are relatively benign. The greens can be “fun” to putt, having the characteristic Bryd undulations. Before teeing off, director of golf Jason Monahan told us to pay attention to the signs on the side of the fairway on the second nine, “You will be playing in South Carolina since the course straddles the state line before turning back to the clubhouse.” That’s certainly not something many golf courses can boast. However, every player at Farmstead will remember the 18th hole. It’s a par-6 and from the back tees 767 daunting yards with water running from tee to green on the left side. Our foursome had been playing a shorter tees until we reached this monster and of course had to try it from the tips. The results were mixed with a nine, a seven, a five and an in-your-pocket. Fun and memorable. Moving on to Carolina National Golf Club we had the advantage of head professional Phil Smiley accompanying our foursome and he imparted his wealth of course knowledge of this Fred Couples design. The course is in Bolivia near the Lockwood Folly River and winds its way across the low country terrain. There are three distinctive nines with each routed in a loop away from the clubhouse so they do not crowd each other. We were especially impressed with the par-3s on the Egret nine. 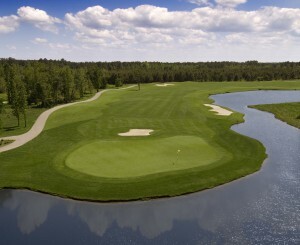 The fifth requires a modest carry over a marsh with the green angled away from the centerline of the hole. Fortunately, to catch any wayward tee shots Couples placed two bunkers that prevent a ball from skipping into the hazard. Then there’s the longer par-3 number 7 which plays slightly up hill (or what passes for a low country hill) with the green again angling away, this time to the left. Standing on the tee the most prominent features are the faces of the flanking white sand bunkers and the immense false front or as we prefer to think of it, a safety zone short of the putting surface. 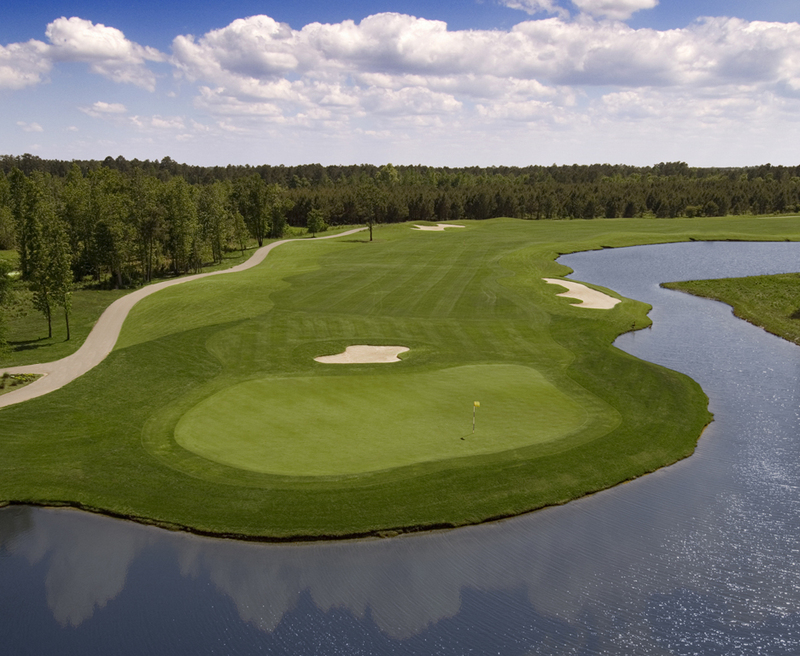 So, golf in the Brunswick Island area of North Carolina is diverse and most of all fun which along with the other activities offered make it a wonderful vacation spot – a great choice for families or couples. If you’re interested, there’s lots more information at http://ncbrunswickgolf.com/ .